Save money. Have fun. Support the zoo! Are you ready for a full year of wild adventures? 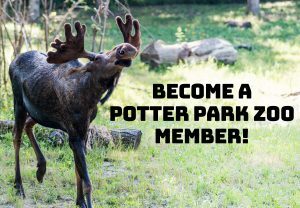 Become a Potter Park Zoo member! Members receive free standard admission, discounts at our gift shop, concessions and much more. Best of all, you are making a lasting impact on wildlife conservation – for now and for years to come! Ready to Purchase a Membership? Support Potter Park Zoo and purchase a membership today by clicking here! Questions? Please contact Kelly Gibson by phone at 517-342-2717 or by e-mail kgibson@ingham.org. To log on to your membership account to renew your own membership, edit your member profile or access your benefit discounts click here. Save money by renewing online! Members are automatically assigned log-in identification. When you log in for the first time, click “Need help logging on?” below the password box. Follow the instructions to reset your password. An e-mail is then sent to the e-mail address we have on file. This will allow you to set your own unique password. Interested in Giving a Membership as a Gift? A membership to Potter Park Zoo is a great gift for friends and family. If you are interested in purchasing a gift membership for a first-time member, please click here. To renew a gift membership, please call 517-342-2717 or e-mail kgibson@ingham.org. Want to Learn More About the Reciprocal Zoo/Aquarium Program? Be sure to call ahead when planning a visit to confirm their reciprocity discount. Occasionally the list of participating institutions changes. Discounted admission is generally only honored for the adults named on the membership card and any children living in the household (for those with a family membership). Some institutions limit reciprocity to two adults and two children. In order to receive your discount, zoo members will be asked to present their membership card and a second form of identification when visiting another zoo. Click here to view the AZA Reciprocal List. Visiting from an AZA Reciprocal Zoo/Aquarium? AZA Reciprocal Admission to Potter Park Zoo includes discounted admission for up to two adults (as named on the visiting member’s card) and if it is a family membership, up to two children under 18. Children under 3 are free. Reciprocal benefits apply to admission only and do not include additional guest or caregiver privileges, extra discounts, benefits, parking, special events, etc. that may be offered at your home zoo.